Usain Bolt and his fellow Jamaicans set a new world record in the 4x100m relay. Jamaica's Usain Bolt celebrates as he finishes first in the men's 4 x 100-meter relay. Jamaica set a new world record with a time of 36.84 seconds. Usain Bolt won his third gold of the London games Saturday, anchoring a Jamaican team that set a world record in the men's 4x100m relay. Bolt, already a near-mythical figure in track and field, entered the London games facing questions about his ability to defend the three titles he won in Beijing four years ago. With his customary braggadocio and flair for the dramatic, he swept all three -- the 100m, the 200m and, finally, the 4x100m. The Jamaicans finished the relay in 36.85 seconds, breaking their own record of 37.04, which they set last year in Korea. The American team, staffed with its own set of heavyweights, including Justin Gatlin and Tyson Gay, equalled that broken record, finishing second in 37.04. Trinidad and Tobago won bronze in 38.12. The record-fast relay brought Olympic track and field competition to a fitting end. It was the last event at Olympic Stadium before Sunday's closing ceremony. Bolt was sure to make the celebration last. After crossing the finish line ahead of Team USA's Ryan Bailey, Bolt saluted the roaring crowd, headed to the stands for some hugs with fans, then walked the track with his teammates, flexing and posing. 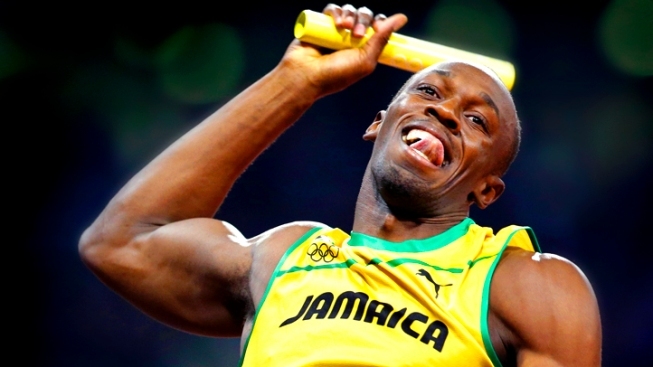 At one point, an Olympics official asked Bolt to return the yellow relay baton he was holding, and initially Bolt refused, apparently wanting to keep it as a memento. The official persisted, and finally Bolt acquiesced. The crowd booed. The Jamaicans then posed for pictures in front of a scoreboard showing their record-breaking time. A little while later, an Olympics official appeared to return the baton to Bolt, and the crowd cheered its approval. The Bolt performance followed a dominating race by American women, who won their second relay gold in as many days. The team of Dee Dee Trotter, Allyson Felix, Francena McCrory, and anchorwoman Sanya Richards-Ross crushed the field in the 4x400m, finshing in 3:16:88, nearly four seconds ahead of the Russians, who came in second. The Jamaicans took bronze. The victory came a day after the American team of Tianna Madison, Felix, Bianca Knight and Carmelita Jeter set a new world record in the women's 4x100m relay. Felix has now won three gold medals in London, and Richards-Ross two. Each has four medals in their Olympic careers. Also on Saturday, Briton Mo Farah won his second long-distance gold of the London games, completing the men’s 5000m in 13 minutes, 41.66 seconds, crossing just ahead of Ethopia’s Dejen Gebremeskel. Kenya’s Thomas Pkemei Longosiwa came in third. Russian Mariya Savinova won the women’s 800m in 1:56:19, beating silver-medal winner Pamela Jelimo of Kenya and bronze-winner Alysia Montano Johnson of Team USA. American Brigetta Barrett won silver in the women's high jump, clearing 2.03 meters, just short of Russian Anna Chicherova's 2.05. The men's javelin was won by Keshorn Walcott of Trinidad and Tobago.